Less than three months ago, I reviewed a beautiful storybook app called Beauty and the Beast. Developed by StoryToys, the storybook is a great rendition of the famous Thumbelina fairy tale in 3D interactive pop-up book style. It’s a high quality app that I can easily recommend to any parents looking for a way to introduce the famous story to their juniors. A few days ago, the same developers released a brand new story app, Thumbelina. I have to be honest that I wasn’t too familiar with the original story but after checking out Wikipedia, I’m glad to report that it is retold fairly accurately with slight modifications to keep it as simple as possible. The story starts with a woman who wishes for a child to accompany her. After waiting for many years, she finally asks for help from a fairy, who tells her to plant a magic bean. After the fairy sprinkles her magic fairy dust a few times, the magical bean plant grows and Thumbelina is born. One rainy night, as Thumbelina sleeps in her tiny walnut shell, a big toad takes her away to live with him on a lily pad in the middle of a pond. Fortunately, two friendly fish help cut the anchor of the lily pad, and a beautiful butterfly helps drift it away down the river stream. Soon after, Thumbelina meets a beetle who wants to take her into his house, but his family rejects her so she lives alone in the meadow. During the scarce winter, Thumbelina’s friendly mouse neighbor takes her in and gives her something to eat. 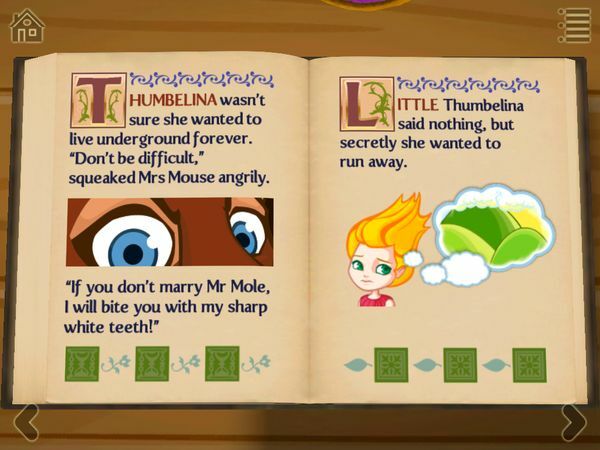 She also tries to get Thumbelina to marry a mole who also lives nearby. When Mr. Mole takes Thumbelina to see his house through a tunnel, a swallow falls through the ceiling and hurt himself. Feeling sorry, Thumbelina nurses the swallow throughout the winter. After the swallow regains his health, Thumbelina flies away with him because she doesn’t want to marry Mr. Mole. Together they fly far away into fairy land, where she finally meets a fairy boy who’s just her size. When the Fairy Prince asks her to marry him, Thumbelina agrees and lives with him happily ever after. Originally written by Hans Christian Andersen, Thumbelina is a suitable story for juniors ages five and up. Many of the interactions in the pop up book are suitable for kids, and the conversations are kept as short as possible. This allows first-time readers to read the story on their own. The app also supports three additional languages: French, German and Spanish. In addition to beautiful illustrations and interactive 3D scenes, all StoryToys storybook apps now come with a 3D sticker book and jigsaw puzzles. In the 3D sticker book, you can apply 3D stickers of characters, objects, and places from the story onto the book to tell your own version of the story. The jigsaw puzzle mini game allows you to play with many of the book illustrations divided into up to 30 pieces. The app gives away some stickers and puzzles for free, but you if want them all you need to unlock them via an in-app purchase. As expected of StoryToys, Thumbelina pop up book has beautiful illustrations and animations. I really like the mini games that are dispersed throughout the 9 interactive 3D scenes. A favorite of mine is the game where Mrs. Mouse asks four spiders to sew a wedding dress for Thumbelina. Taking hints from the seamstress, you combine colorful strings of red, yellow, and blue. Your juniors can use this game as a way to practice their understanding of primary and secondary colors. Another game that I like is the one where Thumbelina drifts down the river stream. 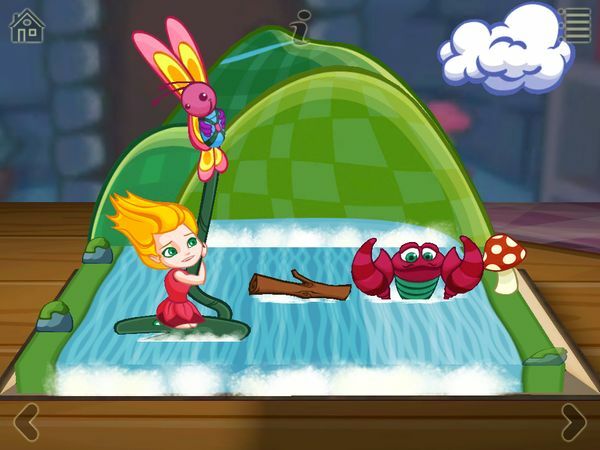 By dragging Thumbelina left and right, you can help her switch lanes to avoid hitting monsters and logs that come her way. The game has three lanes, and is perfect introduction to many racing games. Thumbelina ~ 3D Interactive Pop-up Book is a high quality iPad app adaptation of the famous fairy tale. It keeps the story as close to the original as possible, while keeping this generation of juniors interested with many of its interactive games. If this is the first time your juniors (or you) have heard of the story, I’d highly recommend you to give the app a try. Get Thumbelina ~ 3D Interactive Pop-up Book on the App Store. Thanks to the wonderful folks at StoryToys for sharing the app with us. I really enjoyed reading the story. You should follow us on Twitter and like us on Facebook. Grimm’s Puss in Boots. Join the flamboyant feline in this interactive popup book-app. The Adventures of Don Quixote. An interactive tale of chivalry and imagination, based on popular Spanish novel.